Rebel Pedal! 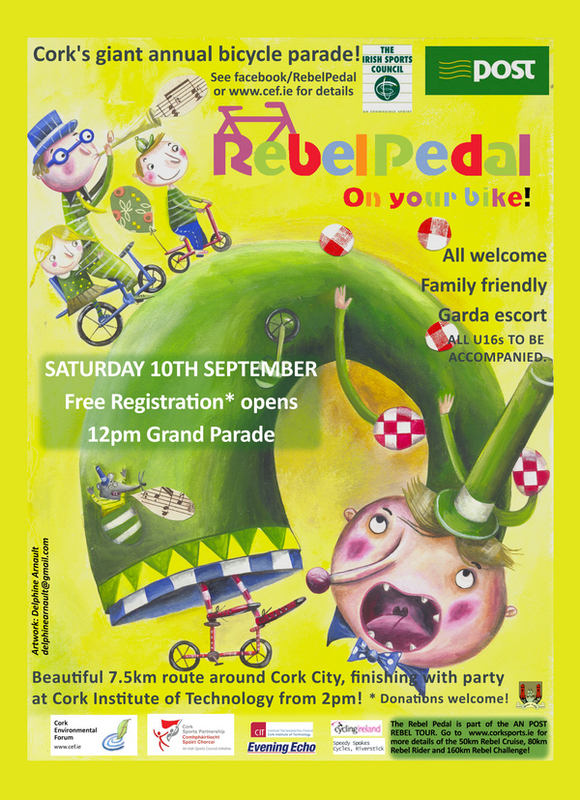 is an annual Cork Environmental Forum bicycle parade that winds its magic through the streets of Cork city. 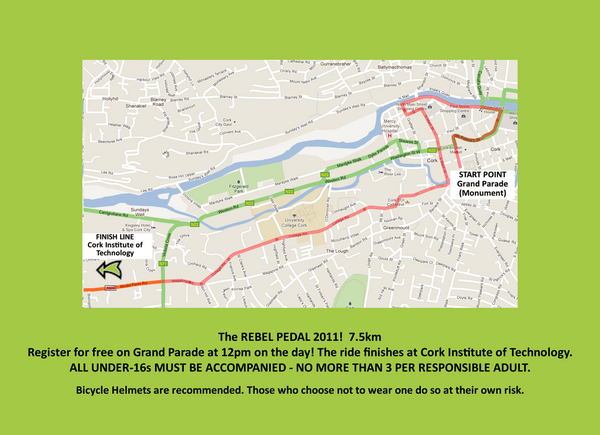 ANYBODY can take part in this free colourful cycling cruise on 10th September 2011 that is part of the 2011 An Post Rebel Tour. Register for free from 12pm at the starting point on Grand Parade (Monument end). The ride will begin at 1pm and estimated arrival time at Cork Institute of Technology is 2pm via a 7.5km route around the city centre. All welcome – particularly families. Please note that all under-16s must be accompanied and no more than 3 per adult. We held two great events on Sunday 22nd May (International Day for Biological Diversity). Read about our Wildflower Walk in Beaumont Quarry, and the tour of Glengarriff Nature Reserve and see the pictures here. The first children's workshop of 2011, hosted again by the Lifetime Lab. Twenty four lucky children made a giant monster installation out of items retrieved from their rubbish bins at home. The monster will appear in different locations throughout the summer! See the pictures here. Cork Environmental Forum has launched its very own free, daily environmental newspaper. Don't believe us?! Check it out here! Featuring stories from Cork, Ireland and the world at large, this is Cork's only daily paper dedicated to the environment. You can subscribe to have it delivered to your inbox every day in time for lunch – and it's completely free. On Monday 21st March we co-hosted a launch of the new FEASTA publication 'Fleeing Vesuvius; Overcoming the Risks of Economic and Environmental Collapse' in Cork Central Library. You can listen to David Korowicz's fascinating talk here. We published our most recent newsletter last week in the run up to the general election with articles from David Korowicz (FEASTA), Lucy Pearce (Dreaming Aloud) and Patrick Treacy (CEF). CEF will be planting trees around the county with local partners to mark this special annual event. 2011 is the International Year of Forestry and we hope to run a number of guided tours around Cork woods and possibly to visit particular heritage trees. Get in touch if interested in attending or guiding! We ran a Water Conservation workshop at Mayfield CDP on the afternoon of Wednesday 13th April and had a stand that morning at the local GAA hall. You will be receiving this as a result of being on our mailing list. Did you know you can also join CEF as a member? This brings all kinds of opportunities for getting involved in exciting work and meeting like-minded people. Our members come from across the different pillars of society and all have a common interest at heart, which is to foster sustainable development in Cork. Subscribe from only €5 per calendar year.